Daisy is a pretty, clean and modern WordPress theme with an elegant, carefully crafted design perfect for a Personal Blog. After activation, the easy installation will allow you to start posting blogs immediately. The theme has been built with more features and smart customization. You will also be able to customize and make it even more unique for your needs. 2 Link Boxes style: Link Boxes are built to be flexible, so that you can link to the content of the website including articles, pages, categories or external content such as Facebook, YouTube, Instagram, etc. Easy Font Customizer: Daisy supports 600+ Google fonts. You can change font, sizes, and padding easily. Link Boxes: Link Boxes are built to be flexible, so that you can link to the content of the website such as articles, pages, categories or external content such as Facebook, YouTube, Instagram, etc. 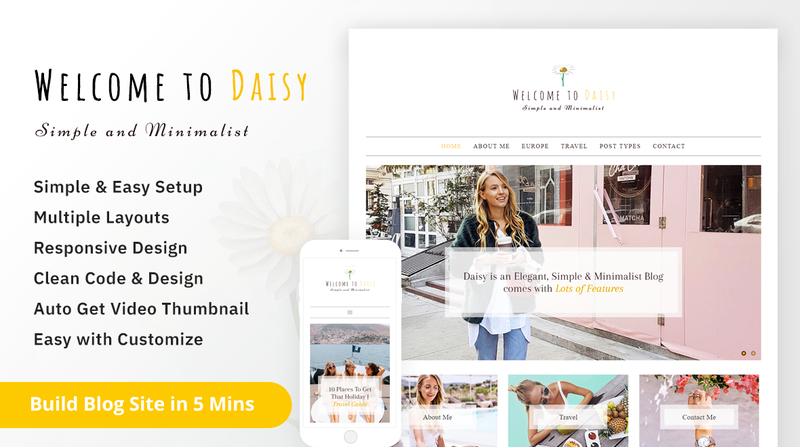 Shop: Daisy theme is compatible with WooCommerce. So, you can build a shop for your blog, easily.